Bestselling author Lauren Kate calls Eve “a gripping, unforgettable adventure—and a fresh look at what it means to love,” and bestselling author Cynthia Hand calls Once “thoughtful, heart-wrenching, and romantic.” Fans of Matched, The Handmaid's Tale, and the first two books in the Eve series will be swept away by Anna Carey’s tale of romance and sacrifice in the chilling dystopia of The New America. I just finished reading Once not too long ago, and the ending just about KILLED me! 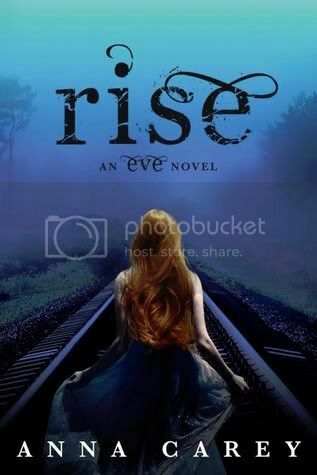 I need to get my hands on this book to see what's going to happen with Eve and Caleb next! Hurry April! I hadn't seen the cover for this but I like how it harkens back to the previous covers-love when trilogies match instead of being changed partway through! Not sure about this series. Wasn't a fan of Eve. I haven't read this series yet but the description for this one makes me want to pick up a copy of Eve! Ooh nice! Never did read this series! I have not read Once yet, and I wasn't a huge fan of Eve, so I am hesitant to pick up the sequel. This does make it sound good though, so I may check out Once. I like the consistency of these covers. You can tell that Eve is moving places, on a journey. Great pick! I still need to read Once!! Can't wait to read that, then this will probably be on my WoW too!